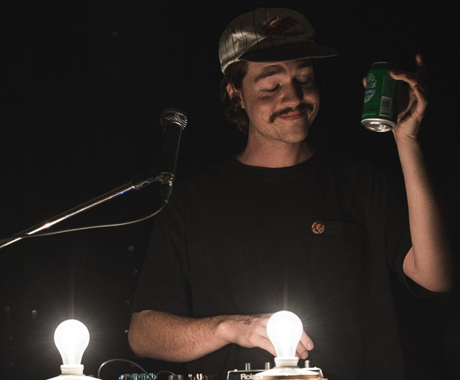 There's always a hushed reverence whenever a former Edmontonian comes back to play, yet who knows if anyone has worked it to their advantage more than Peter Sagar, aka Homeshake. He played alone, with just a few pedals and some playback devices flanked by two lamps. Consider this an effective introduction to Sagar's brand of warped DIY soul. It made for an engaging show — listening to Sagar harmonize with himself was enthralling, and his vocals held the audience's attention no matter how many times Sagar tried to throw people off by artificially altering the pitch. He didn't say much, preferring to let samples playing between songs do the talking. To be honest, he didn't really need to do any talking. Such was the hushed effect at the Artery that it felt like nobody questioned his decision to end his set by killing the house lights and lying on his back in the dark, with a tape loop playing to send the audience off on their way home.